Adaptive and redundant infrastructure helps cushion disasters’ blows. The big news from the Bay Area’s 1989 earthquake was that the transportation disruptions were only inconvenient, not dreadful. Structural failures on the Bay Bridge and several elevated concrete freeways cut major metropolitan commuting routes. 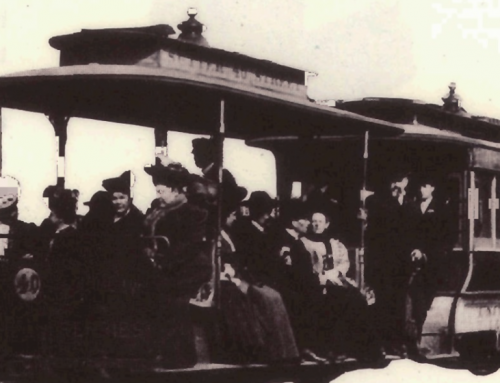 Nevertheless, the regional transportation system didn’t crash at the time. It was resilient because it was redundant – the parallel links took up the burden. Commuters got to work without intolerable hardship. Trucks got their freight delivered, nearly on time. Some businesses suffered in the short term, but only a few failed. 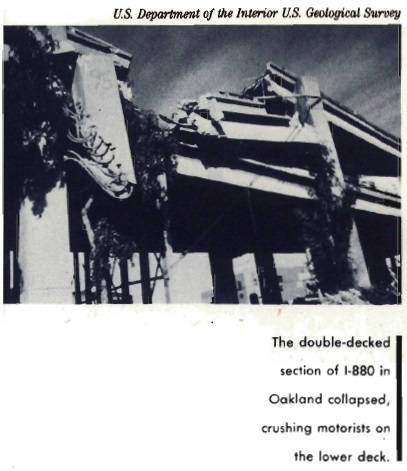 There is no more important feature of the Bay Area’s system than its substantial redundancy – and no more important lesson from the 1989 quake. 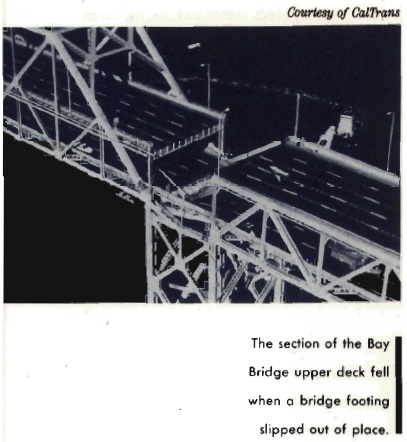 Because we had other bridges that could substitute for the Bay Bridge, motorists had several options to choose among. Because we had an alternative channel with huge and underused capacity in BART’s underwater tube parallel to the Bridge alignment, many transbay commuters and others could get to their destinations on time simply by changing modes. Fortunately, the Bay Area has a network of freeways (including parallel freeways) and a ubiquitous network of wide streets and urban highways – virtually everywhere. We have a great many transit systems, some directly competing with one another. There are more than twenty local diesel bus operations, plus electric buses, electric trolleys, light rail in subway and light rail above ground, heavy-rail rapid transit, a suburban railroad, ferries, jitneys, shuttle buses, and taxis, not to mention cable cars. In addition there are more than five million cars and trucks, mainline railways, major seaports, three major commercial airports, and numerous small general-aviation airports. So when the quake struck down several big highway structures, individual travelers and shippers still had many options. 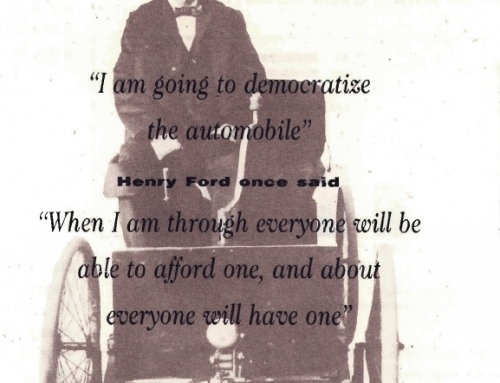 As independent and autonomous consumers of transport services, they exploited those options, and pretty effectively. For some it took a little experimentation among unfamiliar possibilities during the first week or so. But then, most soon settled into one medium or another, and virtually everyone got to work without catastrophic delay or cost. Contrast this with the earthquake’s effects on the city of Santa Cruz. Lying behind mountains that are crossed by only one major road, it was nearly isolated when the road was cut by slides and cracks. Emergency equipment couldn’t get in, and economic disruption was severe. True, Santa Cruz was closer to the epicenter, but the comparative transportation access at Santa Cruz and the Bay Area was a major factor in their comparative losses. 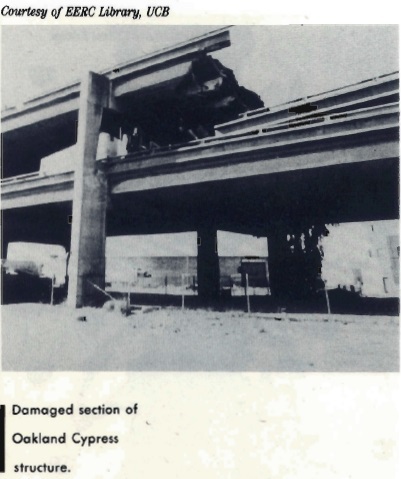 Transport redundancy protected the Bay Area from severe disaster. It’s in part because Santa Cruz lacked such transport redundancy that it suffered unduly. I wish we could say that the genius of the Bay Area’s transport-system lies in the redundancy built into it by design. But it’s not true that it was deliberately planned – that we built parallel routes as an intentional hedge against breakdown in the system. Instead, our standard design criterion calls for just-enough capacity to meet expected traffic loads and no more. Standard planning doctrine calls for least means – for minimum inputs in pursuit of maximum efficiency. It does not aim for maximum effectiveness. Indeed, standard public administration dogma holds that redundancy – duplication or overcapacity – is equivalent to waste. However, it was redundancy that saved us in this instance, as in so many others. In other fields where system-wide failure is intolerable, designers require duplication (or triplication or quadruplication) of component parts. Computers, aircraft, space vehicles, telephones, missiles, and other complex systems, including complex institutions, are built that way. Their designers guard against system-wide collapse by installing standby components, seemingly superfluous parts that stand by, ready to take over in an emergency or whenever a component subsystem fails. Urban infrastructural systems are analogous to those less-complex examples, but the costs of urban breakdown can be enormous as compared to even complete failure of one of those. Loss of life from an 8-point earthquake in places like San Francisco or Los Angeles or Tokyo may be thousands of times greater than loss or life in an airliner crash. Financial losses may be millions of times greater than loss from a bank’s computer crash. Standby Infrastructural components may prove by far the most effective – and least expensive – means for protecting ourselves from natural disaster, despite heavy expenditures for additional physical plant in the short run. So, I suggest that a first principle or system design should be to install redundant subsystems from the start – purposefully. We should do so recognizing the probability, if not certainty, that unanticipated breakdowns will occur, no matter how hard we try to prevent them. The second reason the metropolitan transportation system failed to fall is that traffic systems, like market systems, have self-adjusting and self-correcting processes built into them. Urban travelers are remarkably adaptive. In the short-run, given the chance and given adequate information, they’re quick to find ways around bottlenecks by adjusting their travel routes, times, and modes. In the long-run, through the workings of labor markets and land markets, both job locations and residential locations get readjusted to accommodate traffic congestion and other constraints in the transportation system. Those short-run adjustments were clearly evident during the Los Angeles Olympic Games when dire predictions of horrendous traffic jams proved wrong, mostly because travelers anticipated the congestion and took counter measures to avoid it. The adjustments are observed every day of the year when a road gets clogged and alert motorists find ways of avoiding the tie-up. So it was no surprise when transbay motorists quickly adapted to the closed freeways and the break in the Bay Bridge. They just moved over to the other roads and other bridges, and many became first-time BART riders or ferry passengers. Long-term adjustments are evident in the huge expansion of houses and jobs in suburbs everywhere – the visible outcomes or individuals’ and corporations’ decisions to relocate in response to changing levels or accessibility. Where costs of traffic congestion exceed perceived tolerance levels, many employees look for work closer to home or try to find houses closer to their jobs. Always alert to the availability or an adequate labor force, employers respond to changing costs of congestion and to employee reactions to it. The relative decline of older central business districts and the rise of suburban job markets directly reflect long-term adaptations to crowded radial transportation corridors. San Francisco city held over 50 percent of the metropolitan area’s jobs in 1990, 31 percent in 1960, and only 18 percent today. Among other forces shaping the regional economy, that decline reflects the adaptation of land use patterns to traffic patterns, including patterns of congestion. Over recent decades, the old star-shaped radial travel pattern which focused on the central city has been transformed into a multidirectional network. Today most trips go from dispersed suburban origins to dispersed suburban destinations. The transportation system is thus much more flexible than it used to be when a few radial corridors were the dominant commuter routes. So, when the quake struck even large radial corridors, commuters were less cut-off than they would have been in an earlier time. Right after the quake struck it also became clear that transportation agencies are themselves highly adaptive. 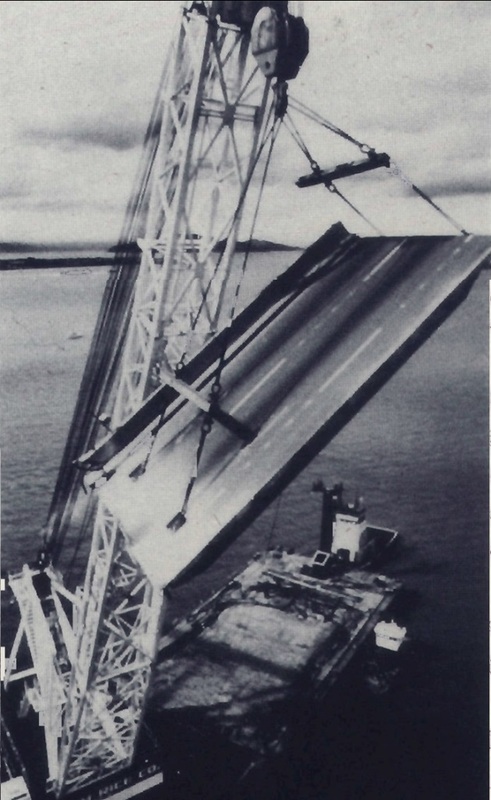 Despite all we hear about bureaucratic rigidity, when there was need for quick response after the quake, they sprang into action with sophisticated diagnoses and damage repair, with effective traffic controls, with supplemental transit and ferry services, and with informative media campaigns that advised travelers about alternative routes and modes. Furthermore, employers proved adaptive too. Some accommodated by adopting flex-time work schedules. Others shortened the work week, relocated work places close to employees’ homes, permitted telecommuting from home, and in other ways tried to adjust to the truncated transportation system. Transit agencies responded quickly to keep undamaged facilities operating and to expand or install mass transit services where roads were closed. Truckers found ways around the blocks. As a consequence, the effect of the transportation system’s failures were not nearly as bad as you might have expected. We are thus led to conclude that, to a large degree, we can rely on the autonomous and adaptive responses of the many components or the metropolitan system and that we are not dependent upon central command-and-control management when natural disaster strikes. Individuals, employers, suppliers, and the various private and governmental organizations can be trusted to accommodate spontaneously. If supplied with sufficient resources, including sufficient infrastructural resources, the metropolitan system seems to be remarkably resilient. Although the transport. System survived the 1989 quake, it will not prove so hardy when The Big One comes, as we’re assured it will. The Iron Law of Seismic Events holds that the further we are from the last quake, the closer we are to the next one and the greater will be its severity. We’re now 86 years from the last big break on the Bay Area sector or the San Andreas Fault in the West Bay and 124 years from the last one on the Hayward Fault in the East Bay. Recent forecasts now set the probabilities of a magnitude 7 or larger earthquake in the San Francisco Bay Area at 67 percent before the year 2020. Next time, the present system may be unable to adapt. So the message from the Loma Prieta quake is clear: we were rescued by redundancy. We should plan now to build-in more redundancy and more flexibility, even as we accelerate efforts to retrofit existing facilities to withstand the major temblors that will come. Of course the first and major effort must be to strengthen existing bridges, overpasses, roadbeds, buildings, and other structures that will be endangered by severe earth shaking. But, despite the most valiant efforts, there will inevitably be structural failures even then. Smart planning requires that we recognize the inevitability of failure and plan accordingly. Parallel systems provide options, permitting the overall transport system to continue to function effectively, even when parts get broken. 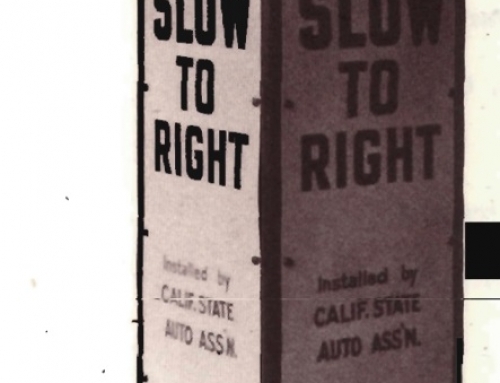 Next time, we should be prepared by deliberately installing parallel routes – and the more the better. For the Bay Area, I suggest that means more parallel bridges, more freeways, and more transit routes. Despite its many transport subsystems, the Bay Area’s transport capacity is already deficient. That’s especially so in the suburbs where growth was earlier spurred by congestion in the metropolitan center and where we’ve been slow to install capacity sufficient to meet present and coming demand. But I suggest we need more than just enough additional capacity to relieve congestion. We also need to install safeguards in the form of excess capacity. Public officials will think it wasteful and inefficient to build a lot or capacity in excess or short-term traffic volumes. But the Bay Area’s future viability may well hang on the region’s ability to continue functioning after The Big One hits – after the region has been shaken by 8 or more Richter points. The ability to move emergency equipment freely can spell the difference between life and death for tens of thousands of persons and mean the preservation or loss of tens of thousands of buildings. The ability to sustain the metropolitan system – distribute foods and medicines; to supply water; to rejoin families; to the keep the economy in working order; to maintain the critical telecommunications, fire-fighting, and policing services – all depend on a functioning metropolitan-wide transportation system. Prolonged dislocation or passenger and freight movements that would follow severe damage to the transport system could, in tum, inflict severe and long-term damage to the local economy and to the public health. By averting some of the horrendous costs that will follow The Big One, investment now in future options and additional capacity will surely yield tremendous returns then. The conclusions concerning transportation must be equally applicable to other public services. Sections of San Francisco were without electricity for about a week after the Loma Prieta shock, because several large transformers and circuit breakers were damaged; it then took time to find and install replacement parts. Future redundancy in power lines, telephone and other communication channels, water mains, hospitals, and the diverse arrays of emergency equipment will all surely increase the chances of surviving a large quake in the future. Are the costs or these additional facilities warranted? It depends on the time horizon we assign to our estimates and the discount rates we apply. We have a notorious habit of heavily discounting future benefits that are further away than the next quarterly report or the next election. However, when the next quake strikes, whenever it comes, everyone will be grateful for the foresight that averted disaster. And for survivors of The Big One – for those who live to tell about it – redundant public facilities systems could well prove to have been the major reason they survived. Immediately following the earthquake, several researchers at the University of California in collaboration with researchers in several governmental transportation agencies undertook a series of quick-response studies. Their aim was to assess the consequences of damage to the metropolitan transportation network. Findings from some of these studies are reported in the following papers, available from the University of California Transportation Center. 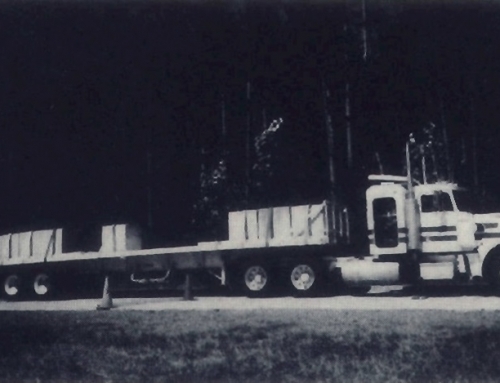 Mark Hansen and Jakob Sutter, The Shake with Freight: The impact of the Loma Prieta Earthquake on Bay Area Truckers. Earthquake Series No.1, 1991. 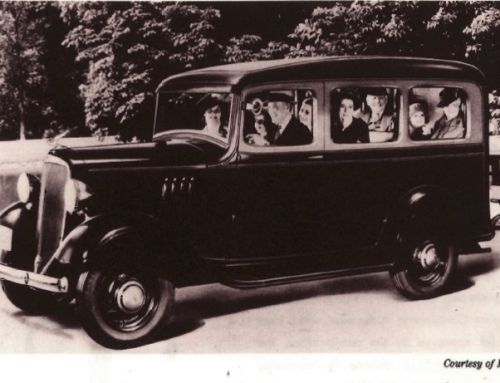 Anna L. Bennett and David D. Little, Earthquake Effects on Employee Transportation. Earthquake Series No. 2, 1991. Cynthia A. Kroll, John D. Landis, Qing Shen, and Sean Stryker, Economic Impacts of the Loma Prieta Earthquake: A Focus on Small Business. Earthquake Series No.3, 1991. Pamela Tsuchida and Linda Wilshusen, Commute Behavior in Santa Cruz County. Earthquake Series No. 4, 1991. Mark Hansen and Sharon Weinstein, East Bay Ferry Service and the Loma Prieta Earthquake. Earthquake Series No. 5, 1992. 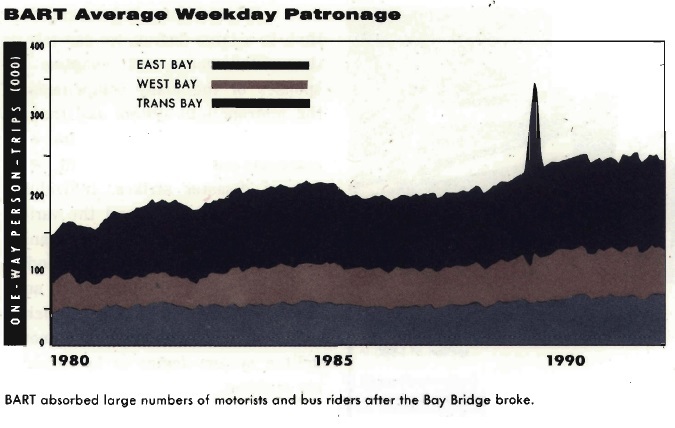 David Reinke, Effects of the Loma Prieta Quake on BART Patronage. Earthquake Series No. 6, 1992. In addition to the above-listed authors, the core research group included Bruck Couchman and Ace Forsen (California State Department of Transportation), Joel Markowitz (Metropolitan Transportation Commision), Wolf Homburger and Melvin M. Webber (University of California, Berkeley).